Great players have donned the green and white jersey of Nigeria’s Super Eagles at the World Cup so selecting a best eleven and good formation isn’t an easy task but here is my pick in a 4-4-2 formation. 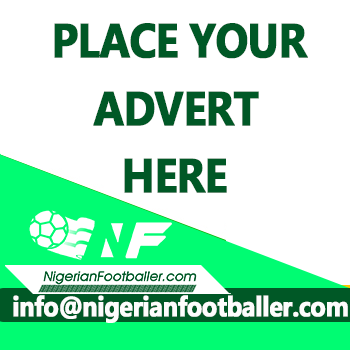 Only three goal keepers have kept goal for Nigeria in 18 matches played across 5 World Cups, Peter Rufai, Ike Shorunmu and Vincent Enyeama. Peter Rufai was in goal at the first two World Cups in USA and France whereas Ike Shorunmu had just two games in Korea/Japan. Vincent Enyeama is at the peak of this pack with various outstanding performances. Rufai should have been my pick but for his horrendous showing in France 98. Vincent Enyeama’s Eagles’ breakthrough came in Korea/Japan 2002 in the last group game against England. With Nigeria already eliminated from the tournament after two loses, Enyeama kept a clean sheet in the goalless game with his save from a Paul Scholes’ screamer the high point for him. 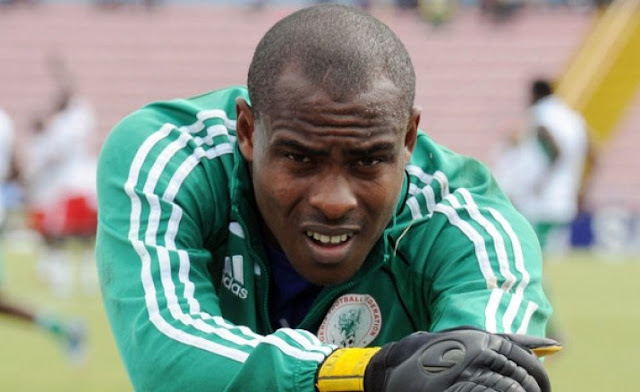 Enyeama will go on to make the Eagles number one jersey his own, participating in two more World Cups and winning two man of the match awards consecutively against Argentina and Greece in South Africa 2010. In all, Enyeama has conceded 10 goals in 9 World Cup games, keeping a clean sheet on 3 occasions. This was the most difficult pick for me as many players have been tried out in this position. Augustine Eguavoen was the pioneer at the World Cup in USA, while the likes of Chidi Nwanu, Mobi Okparaku, head master Mutiu Adepoju, Chidi Odiah, Godwin Okpara, Efe Sodje and Efe Ambrose had manned the position at various World Cup games. 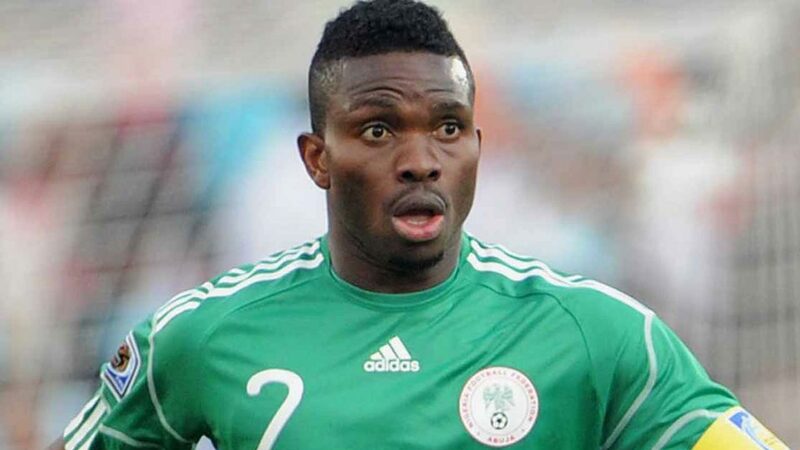 Joseph Yobo was Mr. Utility in Korea/Japan playing defensive midfield against Argentina, right back against Sweden and at center back against England. It was his assist from the right back position for Julius Aghahowa against Sweden that got Nigeria’s only goal in Korea/Japan. Although Yobo who is the most capped Eagle at the World Cup with 10 caps played just two games for the Eagles from the right full back position, a 2-1 loss to Sweden where he shone like a million stars and against Argentina from the 73rd minute after starting the game from midfield. He gets my nod for this position. Celestine Babayaro was capped 27 times for The Super Eagles, 5 of those caps was at the World Cup. He also played the most games in that position for the Super Eagles at the World Cup. Touted as Eagles best left back ever after playing over 200 games for English club Chelsea, Babayaro was solid in the air, excellent in tackles and his forays in over lapping runs were a beauty to behold. He even had a cameo performance as a left winger in the game against Sweden in Korea/Japan 2002. Eagle’s captain in France 98 nicknamed “the gentle giant” marshalled the Eagles defense superbly at two World Cup tournaments, USA 94 and France 98. He played the full 90 minutes in all seven games he played at the World Cup missing out in the game against Paraguay in France 98. He was calm, calculated, and not one to press the panic button on the field of play. The last of his 47 caps for Eagles came at the World Cup, the humiliating 4-1 loss to Denmark in France 98. 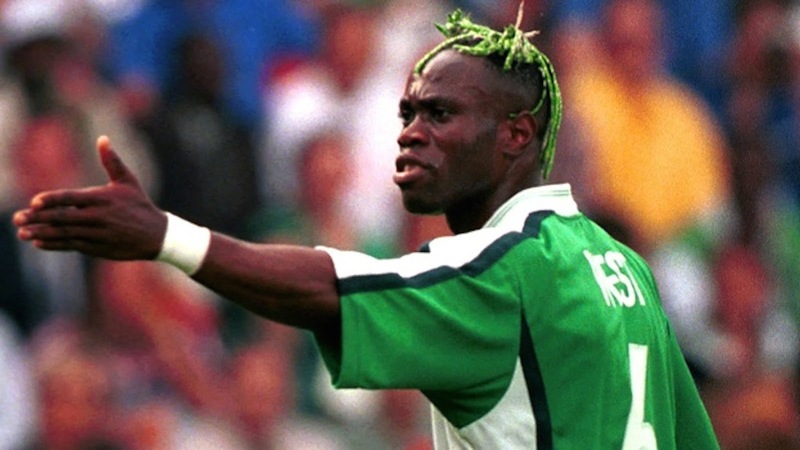 The dread-locks wearing defender starred at two World Cups for Nigeria. In France 98 he formed a lovely partnership with Uche Okechukwu and made it to Korea/Japan 2002 after surviving the clear out by the Nigerian Football Association (NFA), a fallout from the Super Eagles poor performance at the African Cup of Nations in Mali. 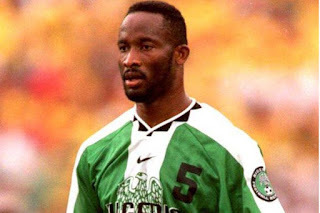 West was a rugged defender that never backed out from a challenge but became an outcast from the Eagles after infamously referring to his team mates as “junk players” and blasting the Nigerian Football Association for disorganizing the team after the World Cup in Korea/Japan. 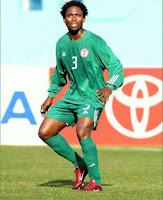 Coach of the Eagles, Adegboye Onigbinde blamed West for the teams’ woes insisting he refused to play to instructions. 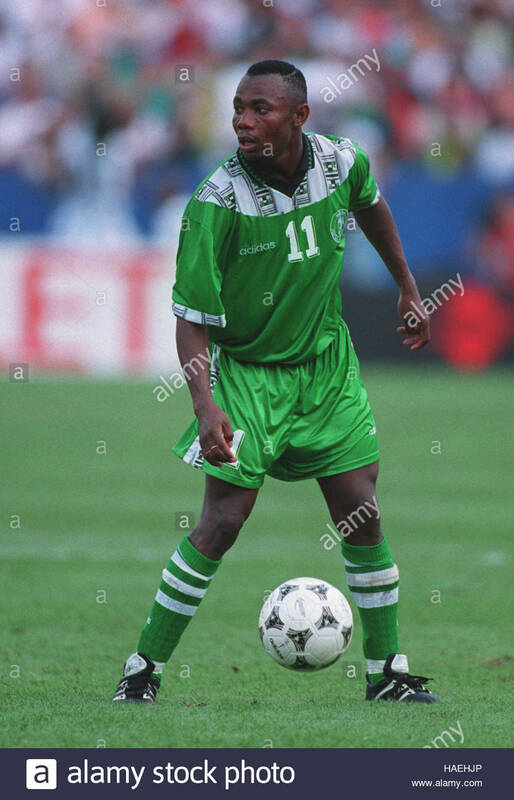 I started following the Super Eagles actively in the early 90s and since then I am yet to see a better defensive midfielder than Sunday Oliseh. 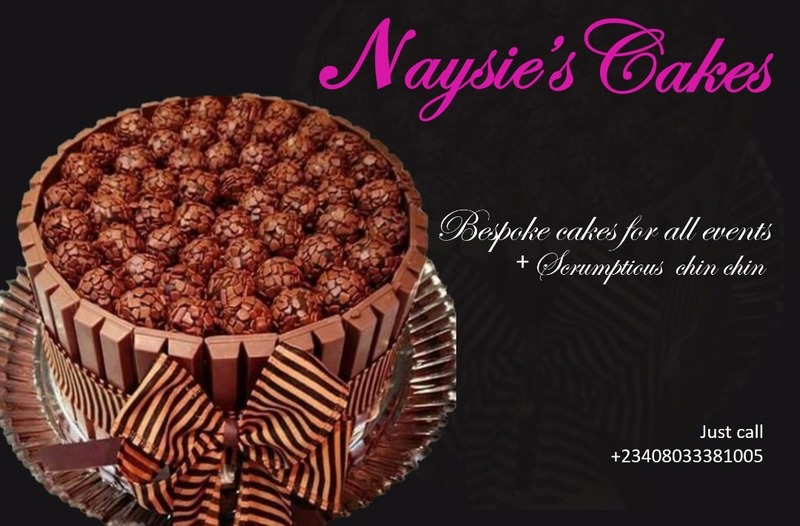 The former coach and captain of the Super Eagles is physical, yet technically gifted, superb in tackles and interceptions and has an eye for that long pass which quickly turns defense into attack. 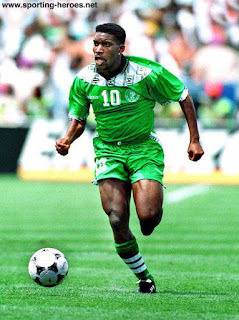 Oliseh was a stalwart of two World Cups for Nigeria, playing eight games, starting all of them and failing to complete just two of those games- against Argentina in USA 94 and against Paraguay in France 98. 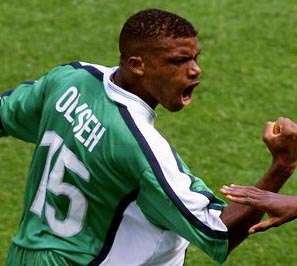 The high point of Oliseh’s World Cup performance for the Super Eagles was when he netted the winner against Spain in France 98, a screamer from 25 yards. Sunday Oliseh failed in his quest to lead Nigeria to the World Cup in Korea/Japan 2002 and despite being captain at the Nations’ Cup in Mali 2002, he was omitted from the World Cup for disciplinary reasons after allegedly insulting then sports Minister, Ishaya Mark Aku. The mercurial, dazzling midfield maestro bestowed with football skills comparable to the best of the best in World football played for Nigeria at three World Cups. He was involved in nine games coming in as a substitute on two occasions. Although Jay Jay doesn’t have a goal to his name at the World Cup, he was named as a reserve in the all-stars team of France 98 a tournament where he was a bright light in the Eagles dim performance, especially in the game against Denmark. He led the Super Eagles to the World Cup in Korea/Japan 2002 in spite of other senior stars being ousted from the team for indiscipline, a testament to his humble disposition. The Super Eagles have a penchant of producing beautiful right wingers from the days of mathematical Segun Odegbami. In modern era the Super Eagles have had the likes of Finidi George, Tijani Babangida, Pius Ikedia, Ahmed Musa and Victor Moses run the right flank in the attacking third at the Mundial. But it is a certain Port Harcourt born winger Finidi George that stands head and shoulder above the rest for me. 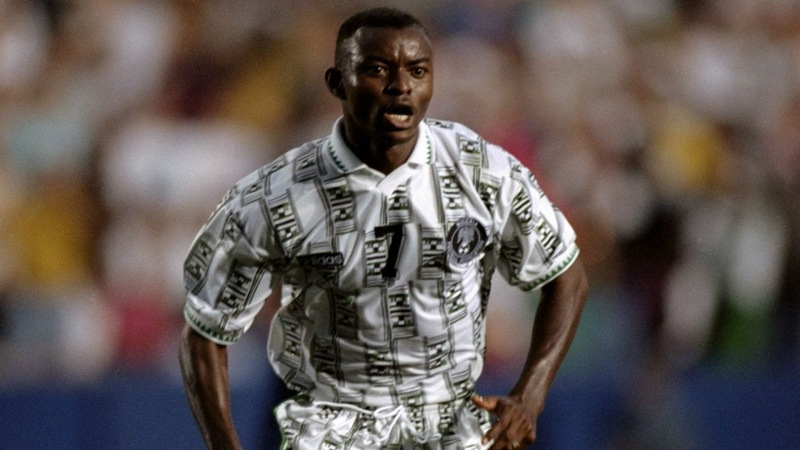 Finidi George played in two World Cups for Nigeria USA 94 and France 98, playing eight games, scoring one goal and bagging three assists. George will be remembered for his beautiful chip against Greece in USA 94 and for and equally beautiful but bizarre celebration where he mimicked a urinating dog. Ever since Emmanuel Amuneke retired from international football prematurely due to nagging injuries in 2001 Nigeria is yet to produce an outstanding left footed winger. Amunike played for Nigeria at the World Cup in USA 94 playing four games, scoring twice and getting an assist in Super Eagles debut at the World Cup. He dazzled for the Super Eagles in his only World Cup appearance from the left flank and the Super Eagles crumbled when he was substituted due to injury against Italy. He was arguably Eagles best player in USA 94 and his best moment was scoring that diving header, the third goal in the 3-0 win against Bulgaria. Daniel Amokachi was nicknamed ‘the bull’ for his style of play, a robust style - not scared to go into a challenge and hunting down defenders forcing them to commit errors. Amokachi played five games at the World Cup, four in USA 94 and a 67 minutes appearance against Paraguay in France 98. He scored two goals and bagged an assist. 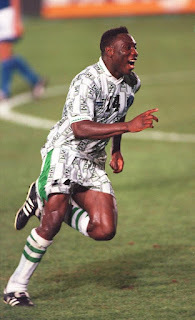 Despite Super Eagles fans and supporters not having the bull as long as they’d want due to nagging injuries, his two goals in USA 94 are etched in their memories as beautiful moments for Nigeria at the World Cup, not forgetting ‘his hip hop flavour dance’ after his goal against Bulgaria. 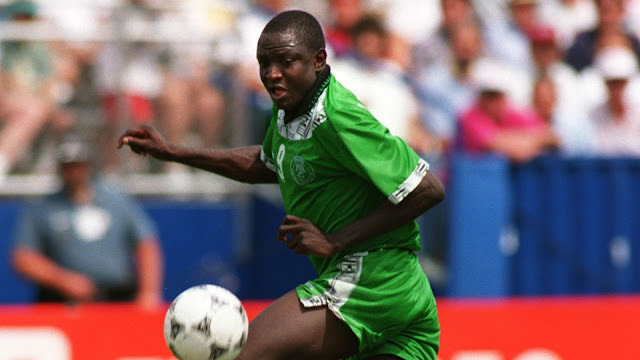 Nigeria’s all-time leading scorer with 37 goals Rashidi Yekini is my pick for the other striking position. The Super Eagles went into her debut World Cup in USA 94 with Yekini as Africa’s finest after winning the 1993 African player of the year award. Yekini was also the best player and highest goal scorer when Nigeria won the Africa Nations Cup in Tunisia 1994 and was the highest goal scorer for the 1994 World Cup qualifying in Africa with 8 goals. Coming into the World Cup with all these accolades a lot was expected from Yekini but opposing teams were already aware of the danger he poses and went all out to nullify Nigeria’s most dangerous threat. Despite all these, Yekini still scored the Nigeria first goal at the Mundial and bagged an assist. He also made it to France 98 but played second fiddle to Victor Ikpeba.